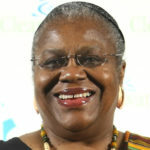 Bernice Johnson Reagon is a song leader, composer, scholar, and social activist, who was a founding member of the SNCC Freedom Singers in the Albany Movement in Georgia. In 1973 she founded the all-black female a cappella ensemble Sweet Honey in the Rock, based in Washington, D.C.
Reagon, along with other members of the SNCC Freedom Singers, realized the power of collective singing to unify the disparate groups who began to work together in the 1964 Freedom Summer protests in the South. "Well, the first time I ran into the term religion, people were asking whether you had any. You know, some people had religion and some people didn’t have religion." "And I used to think that proof that I had religion was whether I knew how to sing all of the songs."